This year is my baby boom year. Since March, friends left and right were having babies. It wasn't until after Aurora had her baby did I realized that I have found the best present for new moms. There's ALWAYS leftover in my household. Even when I cut the recipe down, I still have stuff leftover for at least another meal. So when Aurora had Chloe back in March, she asked if I could cook full scale recipes and she would pay for the frozen leftovers. So when another friends Justin and Olaina had their first baby last month, I went to town for the both of them. Enter Simple Marinara Sauce and Companile Meatballs out of Mark Peel's New Classic Family Dinner cookbook, recommended by our very own Chef Jay. There's a stand at my Alamitos Landing farmers market that sells very, very ripe organic tomatoes for $1 a pound. So it wasn't even an issue getting tomatoes for the sauce. Then again, a couple of huge cans of San Marzano tomatoes were readily available at my local Sprouts as well. 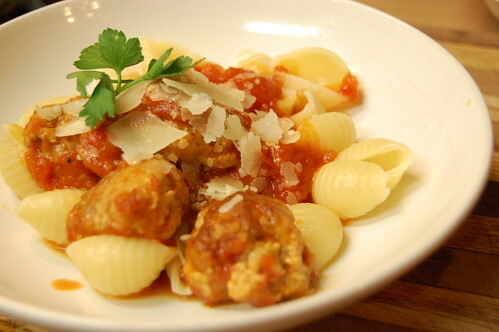 The meatballs turn out to also be good for sneaking vegetables into one's diet. I haven't yet told Brandon and James, Aurora's husband, that there are mushrooms in the meatballs. And they can't tell either. So, hooray! Now, I have to warn you a little bit about the meatball recipe you'll see below. First of all, I didn't follow Chef Peel's recipe to the tee because, even at his own admittance in the preface, he tends to use a LOT of pots and pans. My cutting corners save us a few items to wash after. Secondly, the amount of meatballs this recipe makes is obscene. They did warn you and you can probably tell by more or less 3 lbs. of meat needed. The recipe said to fry them, but after about 3 batches, I gave up and baked the rest. It turned out to be a better way to handle the amount of meatballs on hand. So I baked most of them and fry only the ones I was going to eat for dinner that night. Ready to make some new moms happy? Here you go! *Tips from Mark Peel on seeding tomatoes: Don't waste the juice! Place strainer over a bowl, cut tomatoes in half at the equator and squeeze. Rub the pulp against the strainer to get maximum juice. Dump the seeds. Heat the oil with garlic over medium-low heat and simmer a bit. Add the tomatoes, salt and pepper, simmer 45 minutes, stirring often, until thick. Adjust the flavors. I splash a wee little splash of balsamic in there to give it a little bite and sweetness. Add basil and remove from heat. Let basil steeps for 15 minutes or longer. Original recipe has you remove the whole leaves afterward. I just chiffonade mine and left it in there. I bastardized the original recipe a little bit for the sake of convenience and lack of desire to do any more dishes than necessary. It's still tasty at the end. Optional: flour to coat before cooking. Also original recipe uses 1 tsp cracked fennel seeds. Brandon isn't fond of fennel seeds so I left that out. 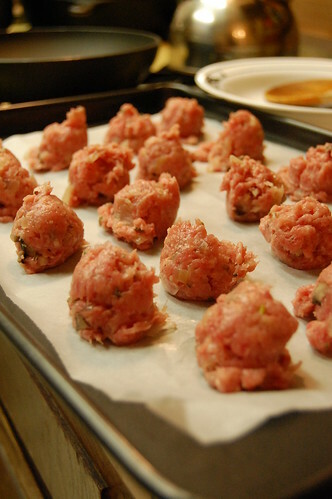 Combine ground meat in a mixing bowl of your standing mixer--this will save you a bowl. Heat oil over medium heat, add onion. Cook until tender then add garlic and stir until fragrant. Add mushrooms and salt (and fennel seeds). Cook until tender. Add 1/4 cup white wine, bring to simmer. Add bread, stir, remove from heat so the bread absorbs all the goodies from the pan. Add the mixture and parsley to the meat. Chill for 30 minutes in the refrigerator. (Full Companile: Before adding the parsley, run the mixture through the food processor THEN add to the meat. I know it's the the same but I didn't really want to go through this hassle. Place ground meat mixture in a standing mixer with paddle attachment. Add the remaining 1/2 cup of very cold white wine and beat at medium speed for 1 minute. Turn to low and beat another 2 minutes until well mixed and holds together in a clump. Cover and refrigerate until very cold. Preheat your oven to 400F. 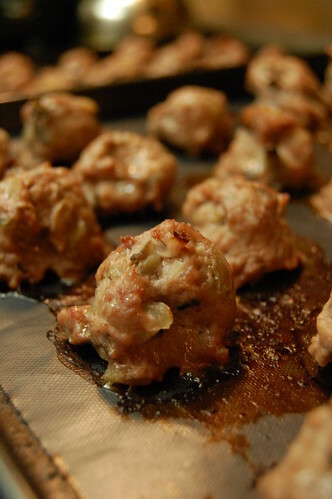 Check the meatballs' seasoning by cooking up a little piece in a pan. 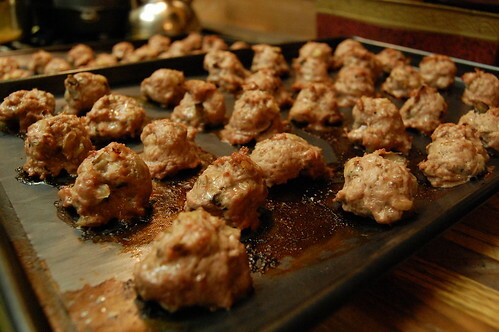 Form your meatballs, place them on parchment paper on a baking tray with edges. Bake for 20 minutes. Aren't you nice making this for friends! And I'm with you, I don't like using a tonne of pots and pans. Who does unless they have someone to wash them up for you (which he probably does lol ).